Note: May not be electrically safe or meet current regulations without repairs by a competent person. 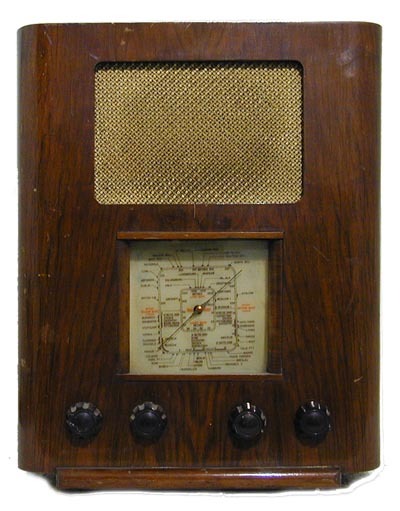 GEC BC 4650 well known 1940s bakelite radio. 3 band superhet, stylish shape, cabinet good, back etc, all OK, 1 wrong knob, untested. Valve scope with plug-in modules, 2 channel, with instruction manual and circuit, works on one channel, other faulty. 1946, large bakelite table set, 3 band. 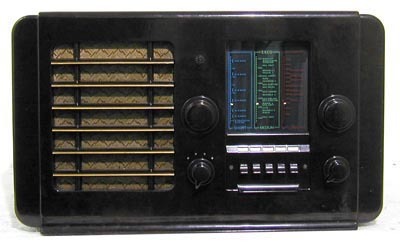 Up market model to the A22, as it had push button preset stations and a proper 2-stage AF amplifier. In many ways the AC only A23 was a better set than the A22, also designed by Wells Coates, but it's not round. So it is not £500+. (It's not an A23 either, it is a U49 which looks identical but is AC/DC, same valve line up as a DAC90.) All good condition, not tested but complete , very slight hairline crack at one side, hard to find but is there. Unusual (possiblyAustrian?) 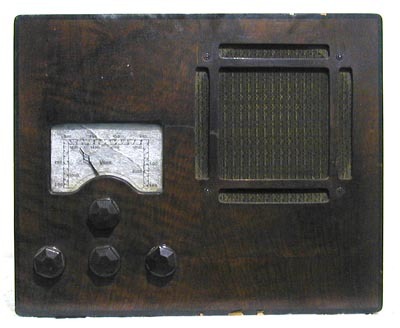 3 valve radio,no information beyond a hand-drawn circuit showing it to be a 120v.DC mains set, 2 valves missing, good cabinet, a real oddity. 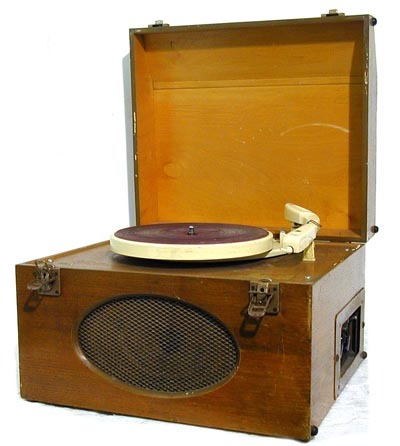 Clarke and Smith schools record player, many people will remember these from schooldays. 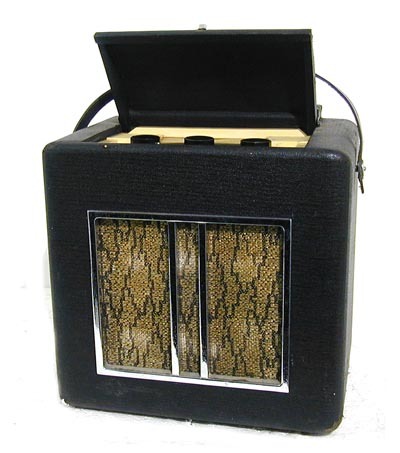 High quality amplifier, Garrard single play deck with removable headshell arm. Scruffy condition but all there and basically works. 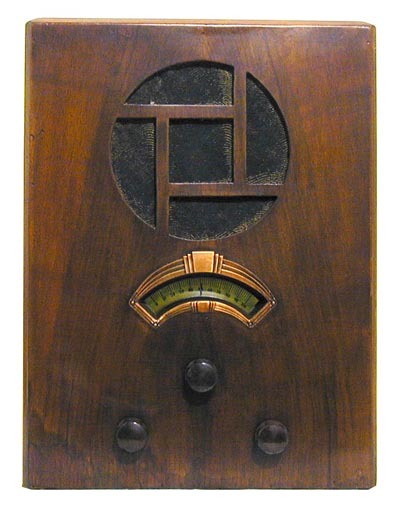 Typical late 30s wooden cabinet 3 band superhet, nice EMI quality set. Cabinet has been stripped and needs refinishing, set was working before storage. 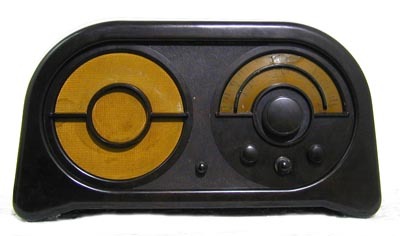 1938 Vidor battery portable, 2 volt British base valves. Quite a nice looking portable, fitted with a home built mains power unit, giving 2v and 90v DC. Works but requires some work. Note we cannot guarantee any aspect of functioning or safety as it is an amateur made mains unit. Should be inspected by a competent person before attempting to use on the mains. 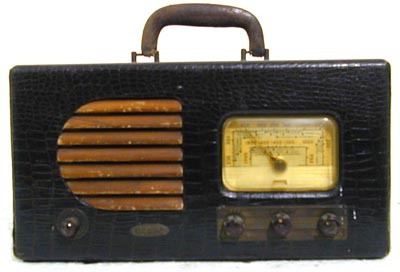 Very early Vidor model- c. 1935, surprisingly it is a mains set, looks like a TRF. Believed working but sold untested. Rexine finish cabinet. 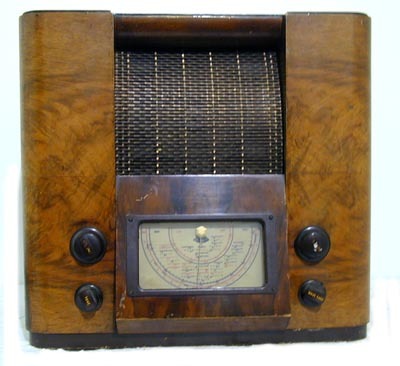 Typical late 30s wooden cased table radio, 3 band superhet. Looks all complete, tired finish but believed working- not tested. 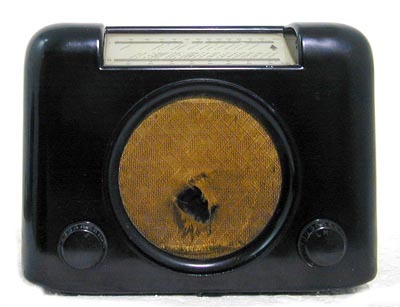 Black bakelite model, the original 1946 version. No cracks, speaker cloth torn but otherwise looks OK, complete. 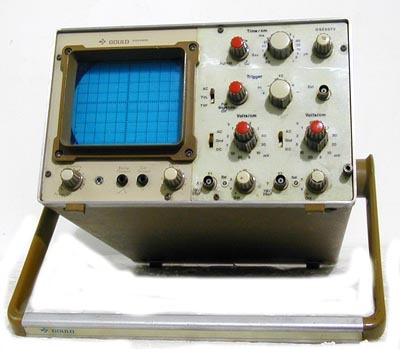 Gould oscilloscope, double beam but only one channel working (displays line but no Yamp on one channel) Works very well as single beam scope. A very original AC86 (Dougal), not tested but all there, original cloth, knobs, back. Has 2 hairline cracks, one underneath, one on side, not easily seen. Worse than this have been described elsewhere as 'mint'. Good project. 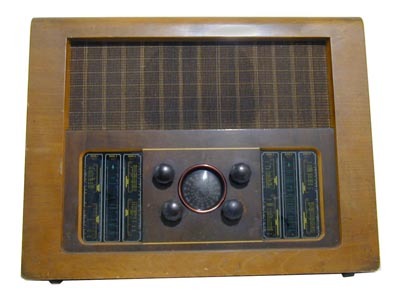 Air King' American mains transportable, looks late 30s or 40s, compact set in rexine finish cabinet, complete and unrestored, untested. Bush EU4 Export model with several SW bands, AC/DC, has RF amplifier. Not working, but looks in good condition and should not be hard to sort out.